After logging into iLab, you will most likely land on the homepage, or may want to navigate to your homepage by clicking on "home" on the left side of the iLab page. On the homepage, you can search for resources, view requests that require your attention and view a list of your reservations. On your homepage, the first panel you will see below the "Getting Started" panel is the "Home" panel. Here you will a summary of important information for this lab, including email communications, links to your core facilities and resources, open requests, past events, and upcoming scheduled events. 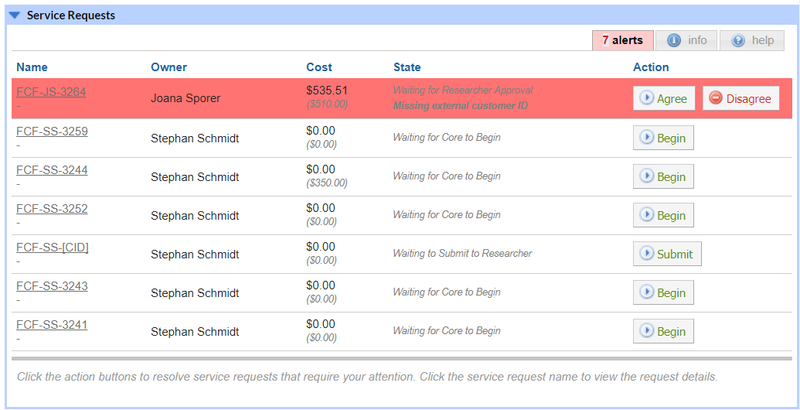 If you have any service requests with any cores in iLab, you will see the "Service Requests" panel on your homepage. In this panel you will see requests that require your attentions under the alerts tab. Requests that require attention could be ones that require your approval, ones that are missing payment information or ones that you have not yet submitted to the core. Principle Investigators and Lab Managers will see requests from all of their lab members and for themselves that require approval in the "Service Requests" panel. Under the info tab within the Service Requests panel, you will see up to twenty of your most recent requests. For more information about the Service Requests panel, click on the help tab. You may also see a "Scheduled Events" panel on your homepage. This panel will display any of your reservations that are still pending core approval in the alerts tab, and all of your future reservations, up to fifteen, in the info tab. Again, click on the help tab to see more information about the "Scheduled Events" panel.